There are numerous reasons why outsourcing QA testing triumphs over an in-house team. Read this article that is bound to get you thinking about getting a capable and qualified outsourced team yourself. Innovation is the key to retaining a power position in a competitive market. While a business has much to focus on, quality sometimes isn’t given as much importance as meeting targets and hitting the numbers. Without proper QA testing, a company can face long-term problems with defective software, below-standard products and so on, that could eventually affect the business revenue. QA becomes more effective when it is severed from software development. The independence ensures a better level of quality and efficiency. This is why outsourcing QA testing becomes an ideal option. It is imperative to choose a company that has the knowledge and expertise of QA testing, along with the skills and experience required to ensure quality, check troubleshooting, and conform to other aspects that are required. There are a number of reasons why outsourcing QA testing triumphs over in-house. A few of them have been listed below. #1. Unparalleled expertise – Every software developed for different industries and businesses require a level of expertise in the respective domain. When it comes to sensitive data, security becomes crucial. When it comes to banking software, complying with regulations gets priority. A QA-centric company will be able to provide you with such domain experts that can provide a critical evaluation of your product. Therefore, this adds more value to the product and improves relations with the customer. #2. Managed end-to-end service – When you outsource your QA testing, the task is managed from start to finish leaving no room for incomplete tasks for whatever reason. You can be assured that the testing is carried through till the end as results have to be delivered. QA outsourcing companies generally assigned dedicated architects and delivery managers to each task. #3. Reduced on-boarding time – When companies hire new employees, it takes longer for orientation, training, and settling into the company environment. With outsourcing, the on-boarding time is reduced greatly. As the team works on the QA testing, with time, they only gain more expertise in your product and can deliver in quicker turnaround times. #4. Fresh eyes always do the trick – A new set of eyes on anything always provides a fresh perspective. When a product is developed, passion plays a big role in missing out on the flaws. This results in many bugs and errors being overlooked during pilot launches and test runs. Having a third party view your product without the internal passion can result in a more objective analysis. Needless to say, this improves quality greatly and reduces error oversight and omissions. #5. Security – A big concern about outsourcing anything is releasing vital company information, sharing source codes and data. However, QA testing does not require the source code. Sensitive data need not be shared when you outsource software for QA testing. Analysis is done on the software from the perspective of the end user. Therefore, the source code remains untouched and intellectual property rights remain intact. Furthermore, QA testing is done with full IP protection. #6. 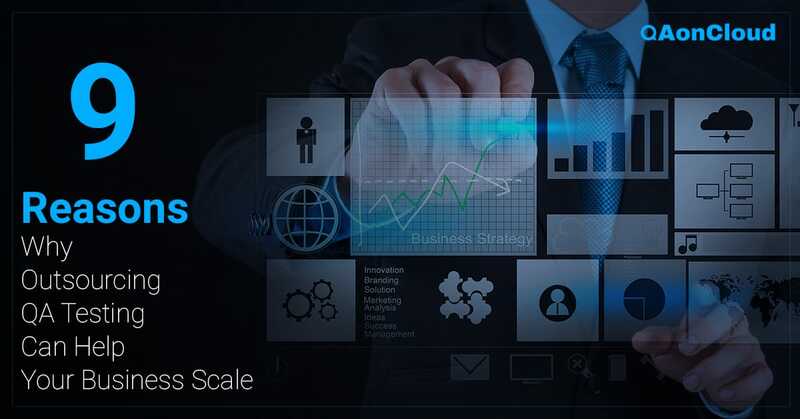 Scalability – Outsourcing can be done independently or as an extension of an existing QA team. Clients are, therefore, free to upsize or downsize the team size as per the changing requirements. #7. Mitigate costs – QA testing can be outsourced on project or need basis. This reduces the costs of having full-time employees. 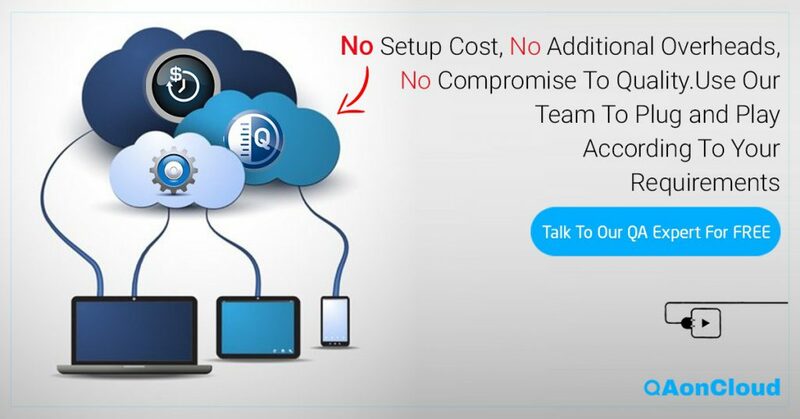 Furthermore, software quality assurance companies, like QAoncloud, provide fully managed automated testing. This not only saves time, but also saves money and improves efficiency. When a product is thoroughly tested, this also saves on maintenance costs and eliminates the need for re-testing. #8. Wide coverage – While companies may hire in-house QA experts, this might limit the number resources. If you have a diversified product portfolio, having limited resources can restrict the QA process. Outsourcing can open doors to wider coverage on account of a larger pool of domain experts. This will help provide the support required for a variety of products in order for them to be a success in the market. Domain experts will be better equipped to handle testing requirement assessments, identify gaps in testing processes, and ultimately, bring about positive results. #9. Reduce risk – The presence of bugs and incorrect codes can take a toll of the health of a business. Getting caught up in the rush to innovate, overlooking critical errors, and being blindsided by passion can put a business at risk of losing a good reputation as well as revenue. An independent reviewer can make a big difference in reducing these risks. Apart from this, when it comes to risk assessment, experience, and expertise in a range of domains and fields is required in order to ensure the final launch-ready product meets all standards, requirements, and benchmarks. Outsourcing can help iron out the creases and fine tune the product. This enhances the performance of the product and the overall satisfaction of the end user. As with any aspect of a business, if outsourcing helps reduce costs, deliver better results, and provides enhanced customer satisfaction, then it becomes the obvious choice. Outsourcing can help provide support to an existing team or even work as an independent team. With so much flexibility, outsourcing becomes an ideal option for many companies who seek thorough quality assurance.